Throughout the US and world wide, sustainable rural development is dependent on the proper management of a region’s natural and watershed resources by the area’s local people and outside stakeholders. Traditional resource management frameworks are not always effective at ensuring sustainable communities in rural areas. What is it? : Community-based watershed management is an approach to water-resource protection, restoration and development that enables individuals, groups, and institutions with a stake in management outcomes (often called stakeholders) to participate in identifying and addressing local issues that affect or are affected by watershed functions. Who does it? : It is for all individuals and organizations- including local governments, tribes, nongovernmental organizations, businesses, schools, citizens, and natural resource agencies- interested in and dedicated to actively engaging their community in researching, restoring, stewarding, developing, and conserving their local watersheds. Proponents of community-based watershed management maintain that involving local stakeholders results in more locally relevant solutions that take into account each community’s unique social, economic, and environmental conditions and values. Stakeholder participation is also thought to create a sense of local ownership of identified problems and solutions, thus ensuring long-term support for resulting management plans. A watershed is an area of land that “sheds” or drains water to a common outlet. Watersheds include the land that precipitation falls on and soaks into and surface water bodies (wetlands, streams, rivers, lakes) that receive water from the surrounding land. A watershed can be defined on many scales, depending on the drainage point that is considered. In Alaska this can range from the 330,000 square mile Yukon River drainage to the headwaters of a small creek in your backyard. Because water moves downhill and downstream, any activity that affects the water quality, quantity, or rate of movement at one location can affect locations downstream. For this reason, everyone living or working within a watershed needs to cooperate to ensure good watershed conditions. We all live in a watershed – our actions impact the watershed in which we live – and we are all collectively responsible for its care. Southeast Alaska encompasses over 50,000 square miles. The region is more than 500 miles long, stretching from the Bering Glacier in the north to Prince of Wales Island in the south. 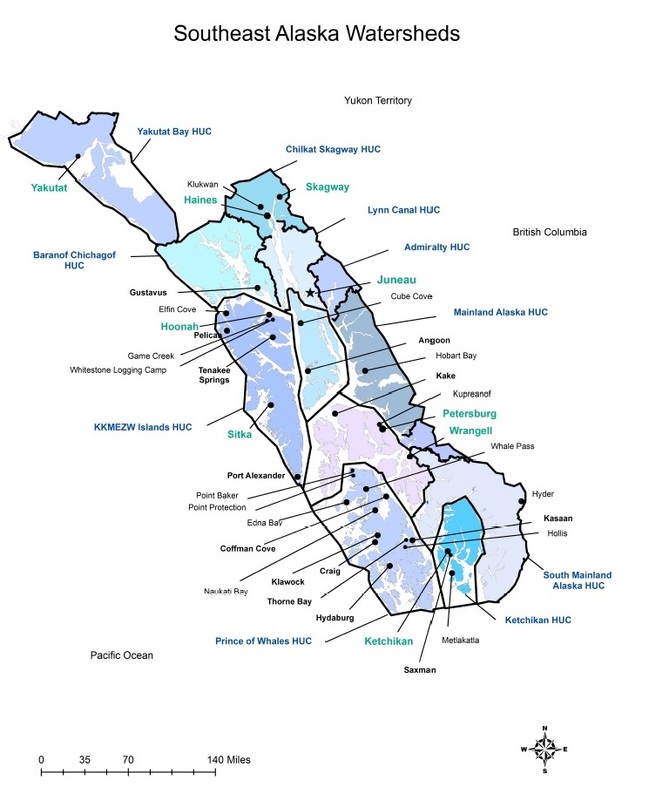 The Southeast Alaska region has many intact functioning watersheds that provide the ecosystem services and natural resources upon which local communities rely. Southeast, though only making up a small part of the state of Alaska is larger than the state of Maine. The region stands out for its vast wild spaces and landscapes that reside within the boundaries of the Tongass National Forest, Glacier Bay National Park, Admiralty Island National Monument, and Misty Fjords National Monument. Alaska’s Inside Passage connects Southeast Alaska’s 33 communities, 1,000 islands and 15,000 miles of shoreline. This region presents diverse challenges and endless opportunities for Southeast Alaskans who are working for the sustainable use and preservation of these waters and lands. Although each community has its own unique identity, Southeast Alaska’s residents and visitors share a common dependence on natural resources and ecosystem services for our cultural vitality and economic livelihood. Community-based watershed efforts are citizen-lead, locally organized groups established to improve and maintain the conditions of the resources in their local area. These groups work to represent the diverse interests in their watershed and strive to be balanced in their makeup. Community-based watershed efforts provide reliable data and information on the important ecosystem services and natural resources within their watersheds to citizens and decision makers who work for the wise management of these waters and lands. They offer education programs that enhance the ecological literacy of the community, as well as actions that steward these ecosystems. These groups develop and implement innovative projects, which emphasizes the potential for sustainable development projects and landscape-scale planning. Community-based watershed efforts work to engage landowners, conservation groups, industry, tribes and government to work together to understand their watersheds. They coordinate the sharing of knowledge, experiences and skills, and engage in meaningful dialog. These collaborative efforts – that these groups strive to facilitate – provide the opportunity for diverse stakeholders to discuss alternatives and possible solutions to resource issues. These community organizations provide services that foster their communities’ way of life, bolster their local economies, and promote the environmental integrity of the watersheds that they depend upon. Contact SAWC if you would like to explore specific ways YOU can launch community-based watershed management efforts.